Busy bags are a great way to keep little ones actively engaged on the go or at home. We’ve been getting them out a lot lately for my preschooler to do while the big kids are doing their homework and it’s been working out really well. This ABC match busy bag is easy to put together and perfect for preschoolers who are learning their letters! I wrote all of the lowercase letters around the plate with the marker and then wrote all the uppercase letters on the clothespins. Then my preschooler can match each uppercase letter to the correct lowercase letter. I did all of the letters of the alphabet because she thinks it more fun to have them all, but if that would overwhelm your child you can just do a mix of old and new ones he knows or even just the letters in his name. 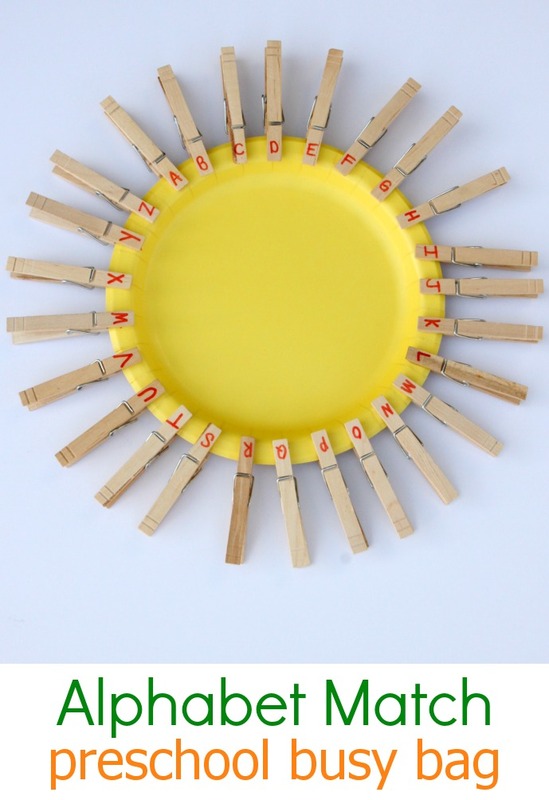 Using clothespins lets kids get the chance to use and develop their fine motor skills. 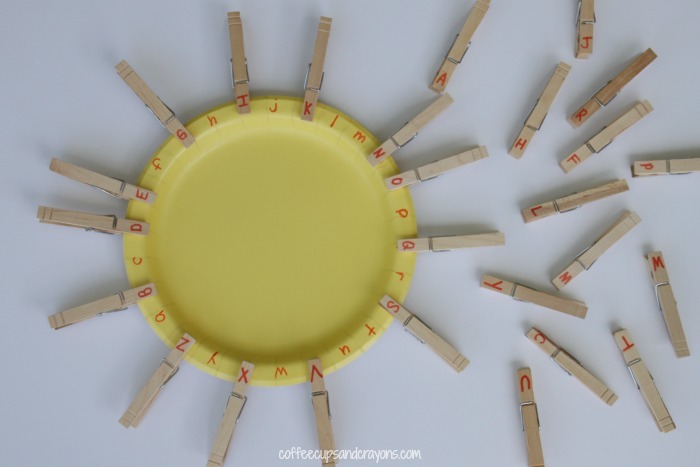 You can use the clothespins for other letter games too. Nice Idea! I think I’ll make some of these over the weekend. Thanks! So happy to hear that Rachel!!! YAY! Yes, if she is still working on identifying letters starting with her name first is a great idea! I love this idea! I think my 5 and 3 year olds would love doing this – especially the 3 year old. He loves clipping things! It would be fab just to do kid’s names – great Messy Church activity, thank you. Or you could write a memory verse or nursery rhyme round the edge! Ooooh! Kate I LOVE the idea of a memory verse or rhyme!!!! I’m going to try it with my kiddos! Thanks!